Three start-ups tackling urban water challenges with technology and an entrepreneurial approach have been recognised by the Imagine H2O Urban Drinking Water Challenge 2018 for their efforts to solve urban water scarcity. Drinkwell (Dhaka, Bangladesh), Microlyze (Denver, USA) and SmartTerra (Bengaluru, India) beat 160 start-ups from 30 countries on the basis of commercial viability, impact and market readiness, and their ability to merge technology with innovative business models. 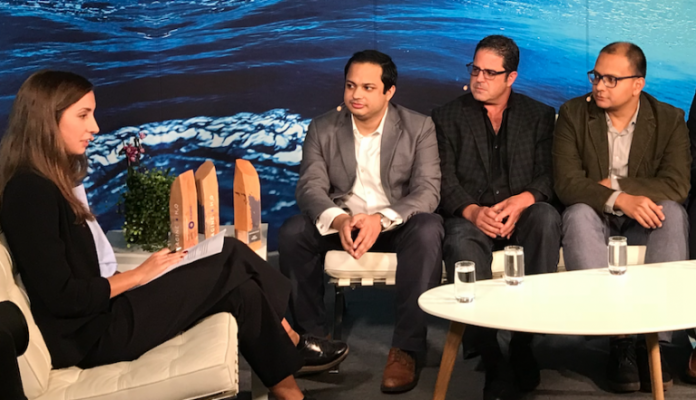 The Challenge’s Founding Partners, water tech leader Bluewater Group and oceans stewardship initiative 11th Hour Racing, have committed up to US$1,000,000 in cash prizes, pilot funding awards and investment to deploy and scale decentralised and data-driven solutions in water scarce cities. The award funding will enable each start-up to launch a new deployment in a water-scarce city. Drinkwell is expanding its turnkey decentralised water purification systems across arsenic-contaminated communities in Bangladesh, focusing on the three million people in Dhaka who live in low-income communities, and are often given no choice but to drink from unsafe, illegal water sources. Microlyze is deploying real-time water testing devices to empower households and provide cost-effective monitoring for US utilities, helping protect the estimated 22 million Americans exposed to lead and other contaminants through their water. often due to ageing infrastructure in cities. Ari Kaufman, CEO and founder of Microlyze, said that being named as a winner is now giving his company the opportunity to put money towards pilots in Chicago and Cleveland, as well as the company’s original pilot in Denver. SmartTerra is equipping second-tier Indian cities with the tools for data-driven decision-making and operations to improve delivery and access for the underserved. Growth in these cities outpaces infrastructure improvements, leaving water supplies unequal and large segments of the population without safe and reliable access. Previous articleThe water you already have is the cheapest and most abundant resource!